Advice for finding a good breeder. Things to consider when adopting a rescue puppy. Dogs come in so many shapes, sizes and personalities. So there's almost certainly a dog out there to suit you. If you're wondering where to start looking, our interactive dog finder tool will show you breeds to fit your lifestyle. And on this page, you’ll find more info on the different groups of dog. Bred to herd sheep, cattle and even reindeer, the pastoral group includes the Border Collie, Old English Sheepdog and Samoyed. They’re very loyal and are happiest when they're doing something useful. And with their extra weatherproofing, they won't want to spend the day curled up at your feet. But if you’re the outdoors type and are prepared for plenty of long walks and training, you'll get on well. This mixed group is made up of dogs that were originally bred for very specific jobs. For example, the Lhasa Apso was bred to guard Tibetan monasteries, while Dalmatians originally accompanied horse-drawn carriages. You’ll find some great personalities in this group, including Bulldogs, Schnauzers and Shih Tzus. If you want plenty of personality in a small package, a dog from the toy group is for you. From Yorkshire Terriers to Pomeranians, and Maltese to Pekingese, these little characters are quick to claim and defend their rights. If you're looking for a lively companion that’ll live happily in a smaller space – and doesn’t demand two long walks a day, they're perfect. From Dachshunds to Deerhounds, and Bassets to Beagles, hounds come in every size and shape. They’re all skilled at hunting using their eyes or their noses. And with enough exercise and plenty of games, there’s a hound out there that would love a place in your pack. Think Boxer, Mastiff, Husky and St. Bernard. These dogs are never happier than when they're being useful, so you'll often see them serving as police or search and rescue dogs. Train them well, and your family will have a friend and protector for life. ‘Terra’ means earth, and these lively little dogs love to dig holes. They have a strong prey instinct and like to have the last word. So if you’ve got some digging space at home (and you don’t have a pet hamster) then a Jack Russell, Fox Terrier or Staffordshire Bull Terrier could be just right for you. 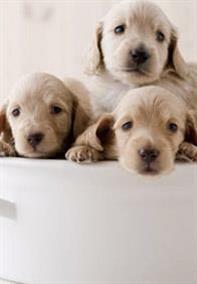 Setters, Pointers, Labradors, Retrievers and Spaniels were originally bred to help their owners when they went shooting. They're loyal, love to learn and are (almost) always eager to please, so they make great family dogs. Guide Dogs and other assistance dogs usually come from this group, too. Keep your gun dog well exercised and you'll have a good-natured friend for life.